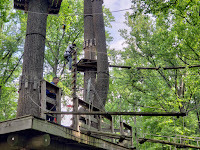 Given my fear of heights, the last place you'd expect to find me is over at the Sandy Spring Adventure Park. But it was this fear, and my hope to tame at least a small part of it, that was our motivation for hitting the park. 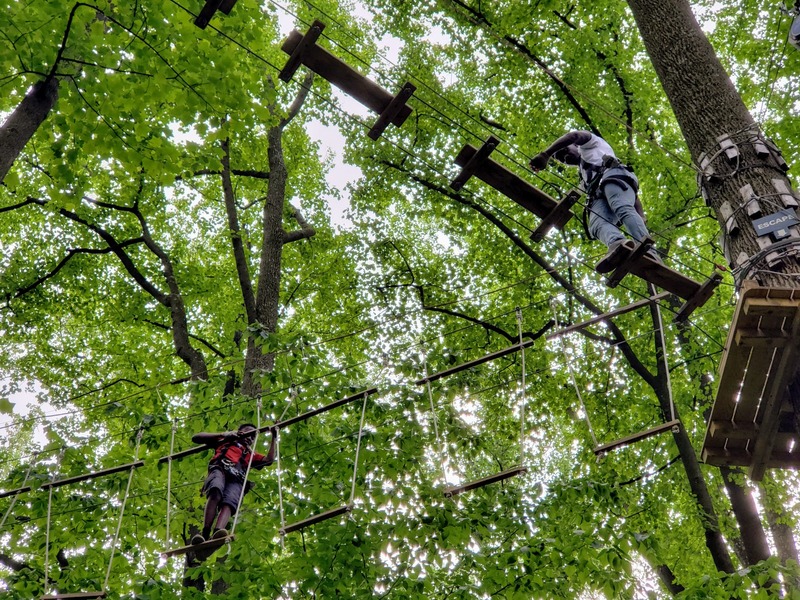 Sandy Spring consists of 13 'trails' that take you to various heights in the trees. 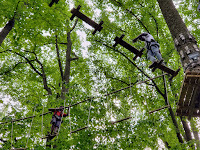 A trail is made up of zip-lines and obstacles, all connected by a series of platforms. 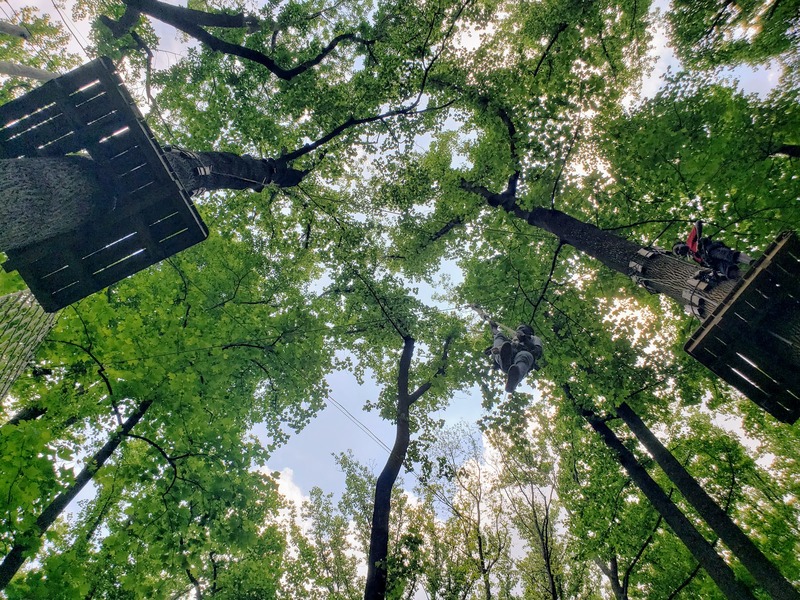 Basically it's a playground suspended up to 65 feet in the air. Through an ingenious system, you clip into a safety cable at the start of the trail and you are guaranteed to remain attached until you step safely on the ground. We picked Sandy Spring because it promised so many skill options. I figured I could master the course designed for 5 year olds (yes, 5 year olds!) and then move on from there. We brought along Fearless M and Dauntless P, who I knew would gladly embrace the more challenging courses. There would be something for everyone. The safety briefing and test obstacles went by quickly and before I knew it, I was standing with Shira on the start platform. From this platform, all 13 trails begin, some with impossible looking ladder climbs, others with fairly tame looking bridges. I felt surprisingly calm, a fact I owe to the promise that I'd be able to tackle a Purple level course. You know, the one designed for 5 year olds. There are two purple courses, and one of the staff members suggested we go on Firefly: it had no other guests on it at the moment. So we walked over to the Firefly start point and I was hit with my first test. 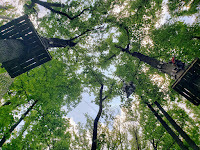 The first obstacle in Firefly was a zip-line. Whoa. Shira clipped in, got settled and zipped across to the following platform. And just like that, it was my turn. I tried desperately not to think. Sure, I could have spent time psyching myself up (you're totally safe! kids are doing this! you literately can't get hurt! ), but that would have given the voice in the back of my head time to chime in with reasons why I shouldn't do this. So as mindlessly as possible I clipped in and pushed off from the start platform. 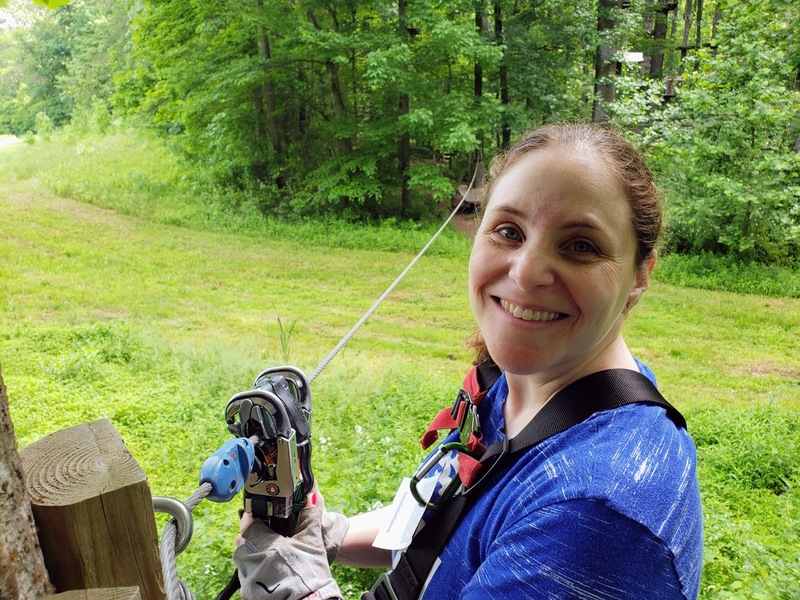 As I zipped across the tree tops (at 15 feet in the air, mind you), the harness hugged me securely and I felt surprisingly comfortable. I was expecting to be hit by a wave of fear and panic; it never happened. I simply zipped and it was simply fun. I have to say, it was awesome. 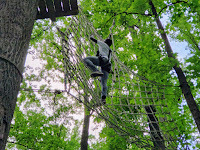 Feeling good, Shira and I then turned our attention to the next obstacle: a sort of wobbly bridge thing. I had no problem getting across it. And so it went: Shira would knock off an obstacle, promise me that it wasn't too hard and then it would be my turn. 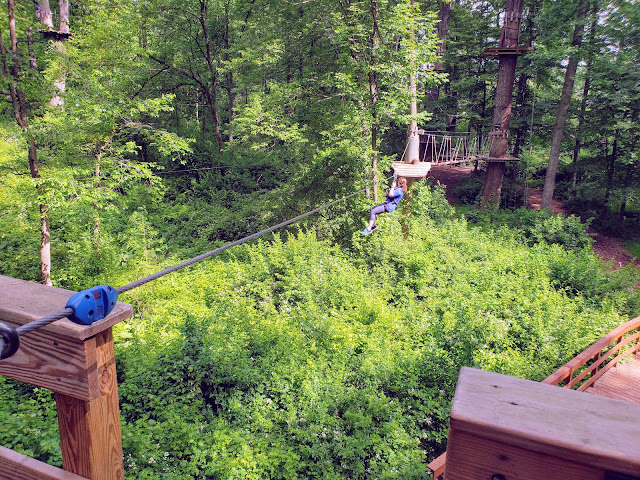 Our big finish was another zip-line to the ground. I finished the course and felt like I'd accomplished something huge. After checking in on P and M, and of course finding them in the tree tops and quite happy, we made our way back to the start platform. We completed the second purple course without issue and then made our way to a Yellow course. While Yellow is the next notch up in terms of difficulty, it's still considered easy and it's still at 15 feet. The first couple of obstacles in Yellow were no problem. But by the third obstacle, I found that I was truly working to stay upright. 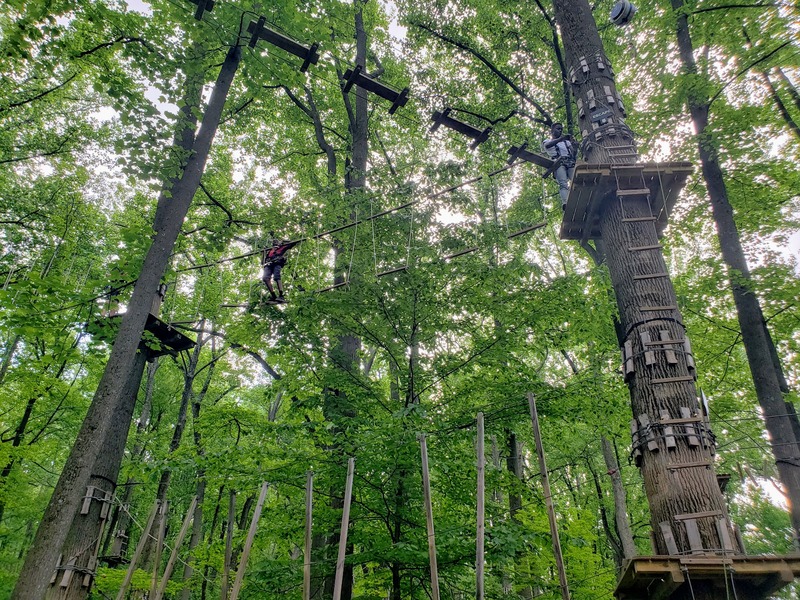 While I expected the zip-lines to be the tricky part, they turned out to be easy. The various bridge like structures, even on Yellow, were no joke. 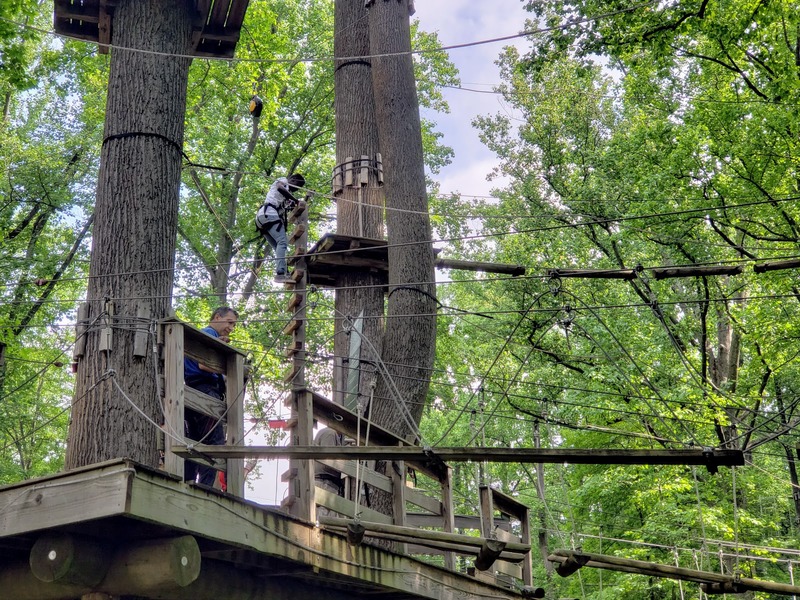 Given the safety harness system, you're never falling more than a few feet. But still, I was truly humbled by how much effort I needed to put into the Yellow course. After our 3rd course it was time to call it a day. 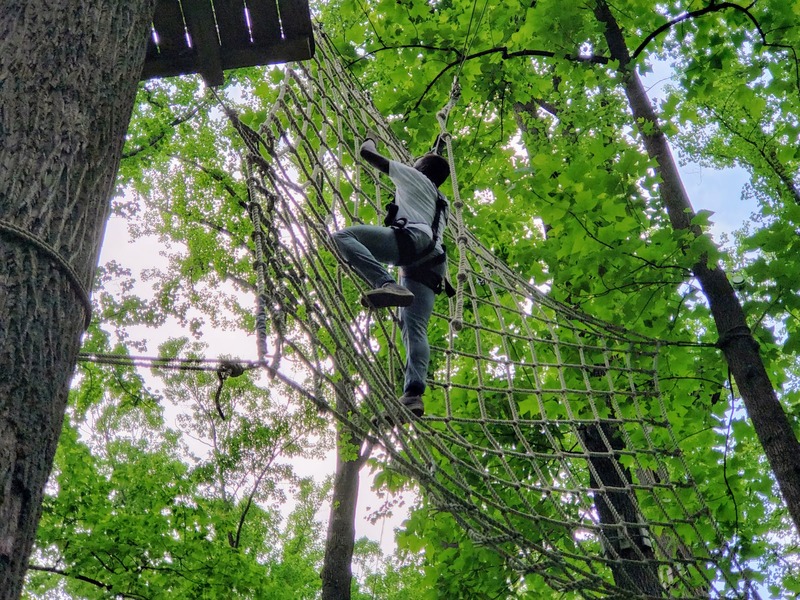 We pulled the kids off of the Black Diamond course, which if given enough time, they'd almost certainly have completed (as well as done the next level). They were truly fearless and exactly the type of person this park was designed for. Overall, our experience at Sandy Spring was great. The staff was warm and helpful, and the course options were as plentiful as promised. Two notes of caution, however. First, if you buy tickets on the website it talks about buying gloves. What we didn't see on the site, however, was that this is an optional purchase. If you don't buy gloves, then there are free ones to rent (unlike say Skyzone, where you have to buy the special socks). We had purchased the gloves, but asked for a refund in the store. They were glad to give us one. Second, be aware that even the easiest course is far from non-trivial. Some kids are fearless; while others are far less so. Convincing a kid to take that first leap into the unknown may be asking too much. This may be an adventure best tackled when kids are older. If you do find yourself at the park with a kid who's not ready to make the leap, then perhaps a few more times on the safety-practice-course would give them the confidence to try this. I do wish the course was a bit more affordable, especially for someone like myself who's not really taking full advantage of their offerings. 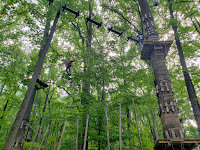 But from poking around the park's website I see that they are considered "the largest aerial climbing course in the US." This is a top tier location, so it makes sense that they would charge top dollar.